First, we will move to Tan Cang Pier by car; and then we will go ahead to Cu Chi Tunnels by speedboat. The journey stretches on the Saigon River, visitors have an opportunity to enjoy the unique scenery on both sides between the mark of modern city and the wildness of river. Next, arriving at Cu Chi Tunnels, you will climb through an impressive 155-mile (250-km) long tunnel network, and visit a typical gun shooting area. You can see some of the most famous underground networks of pathways, hideouts, sleeping quarters, meeting rooms, hospitals, and Hoang Cam Stove. As you know, these narrow Cu Chi tunnels used to provide enough space for a person to crawl their way through. There must be a good opportunity for you to visit the shooting range to fire off a few rounds with an famous AK-47 of Carbine rifle. 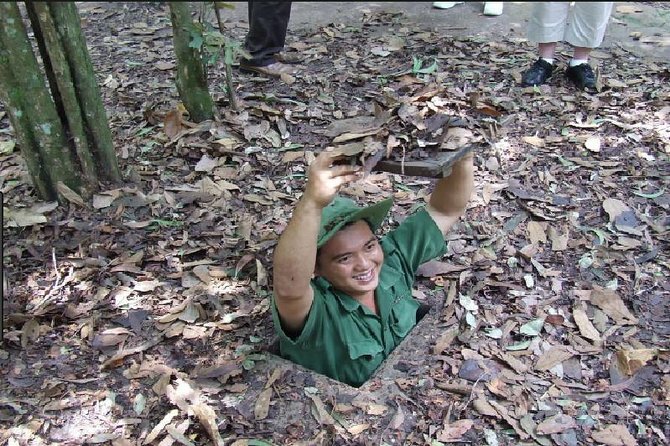 Moreover, during this tour, you will explore Ben Dinh sections of the tunnels where you can understand what life might have been like for the Viet Cong soldier, scheming and fighting from deep underneath of the Vietnamese ground in the past. And then, the local guide will take you to visit and learn more about living conditions of the people who have lived here, their hardships, and their ingenuity to maintain their lives in the tunnels. You will also have a chance to understand more the different local lives around the areas (past and present) and learn more about their cultures and customs. After visiting Cu Chi Tunnels, you will enjoy meal with traditional Vietnam food. At the end of your visit, you will turn back by speedboat. And then, you will be dropped off at Tan Cang boat station in Ho Chi Minh City. At roughly 2:45 pm, motorbike driver and tour guide will pick you up on restored motorbike from Tan Cang boat station pier to show you the best way to get off the beaten path of Saigon. While cruising through the bustling streets like a local on the back of a motorbike, see the sites that you would never find on your own. Learn about things such as the Chinese community and their influence of medicine, Vietnamese customs & religion, and more. We will also visit one of the oldest temples in Saigon where people worship God of The Sea.